Kansas is another one of those states that appear to have a love/hate relationship with gambling. The state takes in more than $13 million per year in revenue from the 8 or so casinos in the state. However, it doesn't look like they like home games, nor do they seem to have any interest in online gaming, made evident by their attempt to ban it in 2011. So while Kansas isn't the worst state for poker players, they sure aren't one of the best either. Online poker isn't specifically addressed in Kansas' laws. However, based on their gambling laws, one could assume that online poker is, in fact, illegal. Gambling is a class B nonperson misdemeanor. Placing, receiving or forwarding a bet and participating in or conducting a lottery on the Internet violates Kansas criminal gambling statutes. 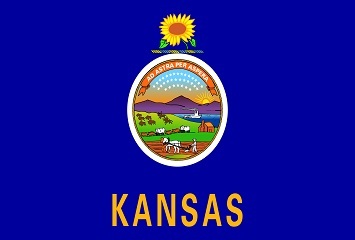 If a bet is placed or a lottery is engaged in from a computer located in Kansas any person or entity participating in such crime may be prosecuted in this state. From our research many web portals agree that home games are illegal because, a) social games are not addressed in Kansa state law and, b) poker falls under the aforementioned gambling law. However, if you read the statute on gambling definitions, it's possible that so long as your home doesn't become known for poker aka gambling, then running your occasional home game may be ok.
(e) A "gambling place" is any place, room, building, vehicle, tent or location which is used for any of the following: Making and settling bets; receiving, holding, recording or forwarding bets or offers to bet; conducting lotteries; or playing gambling devices. Evidence that the place has a general reputation as a gambling place or that, at or about the time in question, it was frequently visited by persons known to be commercial gamblers or known as frequenters of gambling places is admissible on the issue of whether it is a gambling place. I still recommend talking to your lawyer or local authorities before inviting everyone you know for a game of holdem. Do Casinos in Kansas Offer Poker? Poker can be played at many of the casinos in Kansas. Boot Hill Casino in Dodge City and Casino White Cloud in White Cloud, KA both offer a variety of poker games as well as blackjack, roulette, craps, slots and many other Vegas style games. We receive a lot of questions about poker state laws, and more specifically, the gambling laws in Kansas. We thought it would be helpful to post those for you below. Will online poker be regulated in Kansas? I wouldn't count on it. Based on our research they've tried to ban it. I imagine that if they once tried to ban it that a lot of effort would be needed to change the (important) people's minds. Below you'll find a timeline of the most important events in Kansas regarding internet gambling regulation. A bill was introduced that would "attract a new casino to an unoccupied "gambling zone" in the state's southeastern corner" also included a ban on internet gambling, which would include poker, as well as electronic slots and video games from live gaming venues. This bill ultimately failed. Is there an online poker room that accepts players from Kansas? It's weird. Despite their stance on gambling in general, you would think that you wouldn't be able to find a poker room or casino that accepts US customers. In fact, many US accepting sites do not accept players from states that have strict gaming laws. Washington is a good example of this. However, many, if not all US accepting poker sites accept Kansas state residents. A couple sites include Bovada, Sportsbetting Poker and BetOnline. What other forms of regulated gambling is offered in Kansas? Kansas offers horse and dog racing, as well as bingo and the state lottery. Where can I read more about Kansas poker laws? Here are some interesting facts about gambling and poker in Kansas state. Kansas is the only state in the US where the state lottery controls commercial casinos. Notable poker pros from Kansas include Grant and Blair Hinkle. The Hinkle brothers won WSOP bracelets 10 days apart in the 2008 World Series of Poker.